What Ken Be Done? : Day 100! Celebrating 100/365 Days of WKBD! Day 100! Celebrating 100/365 Days of WKBD! 100 Days! I've got to tell you, I'm all about celebrating any kind of achievement - and this really feels like a big one! A century of Ken Done :-) And what better way to mark the event than with a Social Studio Ken Done remake... check out my *fabulous* top, made by Nicole. Thank you! Now, as you would know, most of the time I keep my requests for support pretty low-key. But just for today... if you can PLEASE DONATE to What Ken Be Done. Every dollar raised goes directly to The Social Studio. From $1, to $10, to $100... all of it will help! And it's tax deductible! Charity Sale: Genuine vintage/retro Ken Done purse Wow! 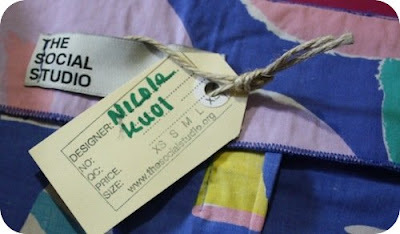 Charity Sale: Genuine Ken Done Sarong / Scarf Wow! Fantastic. I just checked out the social studio site too, they look like a fabulous enterprise. I have forwarded the links on to all my friends on facebook and twitter and I will now hound them to support you and the social studio. Stunning! A worthy outfit to celebrate 100 days.